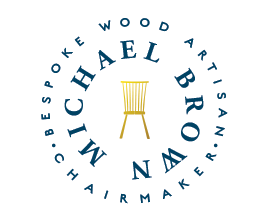 My chair design is my interpretation of the classic English stick chair, the original Windsor chair, from the early eighteenth century. These are not reproductions of museum pieces, but made after much research, including trips to the Windsor chair museum in England and a lot of sitting! I created hundreds of chair prototypes until I came to a design that sits just right. All of my work is critiqued by my wife Theresa, who has a wonderful eye for design and keeps me inspired. She valiantly sat in everything I made on my way to this form and encouraged me along the way. I work in an 18th-century style with 20th-century luxuries and 21st-century design. I craft my chairs and furniture by my hands and with manual tools. I have a very functional workspace/studio which works quite well for me in my back yard. Well, calling it a studio is a bit of a stretch but my workspace is a pole barn that is unheated and has no A/C and is nearly always open on two sides. In the summer I wear shorts and the winter a thermal suit and wooly hat. I have chosen a simple path in life, all my work is handmade, each step was undertaken with utmost respect for the material and the maker. Living the quiet country life working with my hands makes me a truly blessed man. I work with sustainably sourced wood only and try to find my wood either in my backyard or from eco-friendly sustainable logging and sawing enterprises. We have some of the finest woods in the world growing right here, and I am fortunate in being able to work with them. Most of my work is made from North American hardwoods and trees from my woodlot, or salvaged from storm or landscape clearing. I also cut the wood on my own band saw mill. I try really hard to create my work using the most eco friendly way possible. Take a look at my wood choices here. I sailed from England, my homeland, to America in 1985. While sailing I stopped in Bermuda to repair the boat from hurricane damage and met my vacationing future wife, Theresa. After spending 7 years in her home state of New York, we took to our boat to find a place to settle. We bought some woodland on the edge of Beard Creek, and I started to selectively cut trees to build our home. I meticulously sawed the trees into posts and beams, and following the finest practices of generations past, I raised a frame of pine, oak, poplar, maple and sycamore, connected with wooden pegs, that glowed in the setting sun and cut right to my heart.